Liverpool, November 2018. Opening Up The Creative Space seminar and Raising The Roof concert were two seminal events held at the iconic St George’s Hall in Liverpool on November 1st 2018. Ground-breaking in theme, they once again shone a spotlight on this world-heritage-site as a leader in #Accessibility in #Spaces. The events brought together thought-leadership and participants from across culture, arts and architectural fields. Showcasing work and with representatives from architects, city planners, NGOs, entrepreneurs, private and public businesses to artistes, performers and individuals who face barriers to access space, they celebrated the artistic excellence which exists and is just waiting in the wings for a seat at the table. The host and organiser was Universal Inclusion, an organisation led by Jacqueline Winstanley BSc Hons, who is leading the way in making the world a much more accessible place. As last year, this year’s production was also held in partnership with the International Council for Caring Communities (ICCC*) and Liverpool City Council in support of the ICCC International Student Design Competition Fellowships. Both events were supported by Bournemouth Symphony Orchestra, Courage and Sparkle, Disability Today, Disability Rights UK, Evermore Wellbeing, Gooseberry Pink, Jigsaw Medical, LMA Liverpool, Liverpool City Council, Market Accents, Merseyside Woman of the Year (MWOTY), Pink Shoe Club, Soundtrack Recording Studios and St George’s Hall. The two seminar panels debated barriers in creating inclusive cities and opportunities. While the first panel focussed on the build environment, the second panel discussed the creative field. Both sessions highlighted challenges and personal experiences, and demonstrated how opening up the creative space enables us to achieve the UN Sustainable Development Goals (SDGs) . The day’s events were aligned with and fully supported the UN SDGs, fostering the ICCC program: “Imagining the Possible”. Panel speakers included Ade Adepitan MBE, Elle Exxe, Ayesha Gavin, James Holt, Grant Logan, Matthew Wadsworth, Jacqueline Winstanley Bsc Hons, Professor Dianne Davis, John Kiehl, Laura Draper. The moderator was Helene Martin Gee, while Seminar MC was Robert Winstanley. 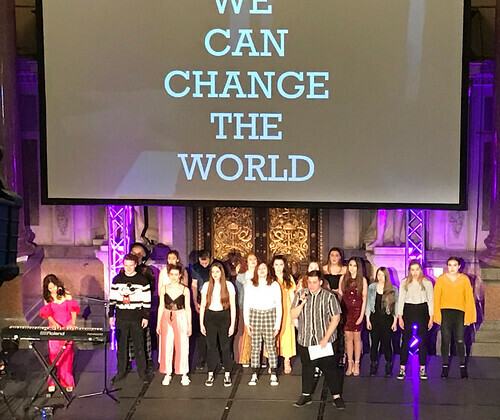 The seminar was followed by a VIP reception with The Alder Hey Staff Choir by Bernie Whelan, where guests had the opportunity to mix with the amazing international talent, speakers, dignitaries and guests before settling down for another stunning concert, which brought these concepts to life. Present for the evening concert were Cllr Liz Parsons, Cabinet Member for Communities & Partnerships Liverpool City Council; Professor Diane Davies, Founder of ICCC and the International Student Design Competition; Nancy Chen Lady Chairman of SEE YEP Chinese Association; Harry Chen Finance Manager SEE YEP Chinese Association and Linda van Nooijn Chairman of Pagoda Arts. Click the image below to view a gallery of moments from the day's events. The concert featured awards and star performances of music and singing from internationally renowned entertainers: The MC was Ade Adepitan MBE, well-known Paralympian, TV broadcaster, journalist and author and he introduced spectacular entertainment from Asa Murphy and his Big Band, Jazz Vocalist ‘King of Swing’; the internationally-acclaimed theorbo and lute player Matthew Wadsworth, Elle Exxe, singer-songwriter who won the Best Female Solo Artist at the Unsigned Music Awards in 2016, the award-winning Pagoda Chinese Youth Orchestra and Dancers who have performed worldwide and who are the first and largest youth orchestra in Europe, James Holt, a solo artist from Bolton and is receiving attention and praise from music industry giants and Napua Davoy, a most extraordinary musician and song stylist, with the Liverpool Media Academy (LMA) performers. In her address, Cllr Liz Parsons acknowledged the thought leadership debated in the afternoon and the role of Liverpool City Council in moving towards achieving this accessibility to spaces. Also present was Professor Dianne Davis, Founder of ICCC and of the International Student Design Competition which, since its inception in 1994, has reached over 9000 student architects in over 60 countries. The competition focusses on the implications of the growing numbers of older people - the ‘age quake’. It encourages young architects to work with older people to find innovative solutions which counter isolation, support intergenerational contact and maintain health and well being. Winners of the competition present their ideas at the United Nations Headquarters in New York and are able to join a Fellowship programme. The programme is designed to enable young architects to continue to develop their ideas through continued research, study and travel. Most importantly they are able to work with mentors to begin to develop the leadership skills which will enable them to play a significant part in the design of future age -friendly cities and communities. The Liverpool ‘Raising the Roof’ concert is part of the activities to raise awareness and funds for the Fellowship programme. Professor Davis presented two exemplary individuals with the ICCC Caring Citizen of the Humanities awards: Dr Roderick Hackney, a world-renowned architect, leader and influencer, and Gail Jones, entrepreneur and global leader in diversity and inclusion for the contributions they have made, and continue to make. The concert also included footage showing the work of the ICCC International Architectural Student Design Competition Winners and Fellows. Universal Inclusion brought together a talented group to assist. This included Executive Producer Jacqueline Winstanley, Founder and CEO of Universal Inclusion; Musical Director John Kiehl, co-founder of Soundtrack Recording Studios; Stage Manager Ellen Kerr from Merseyside Woman of the Year (MWOTY) and Marketing and Communications Director Noreen Cesareo from Market Accents. They were supported by Mike Cash; Professor Dianne Davis; Julie Fernandez; Christine Gong, Co-Founder, Chinese Cultural and Art International Organization; Christoff Karla; Professor Gisela Loehlein, ICCC Vice President for Student Design Competition; Peter Mathius; Emanuel ‘Manny’ Perlman, Alan Smith, Tony Thompson, Dave Mort from Think Print and Dan White. Universal Inclusion leads the way in making the world a much more accessible place, one where everyone feels included. Their ethos reflects the many ways a society can collectively and individually change not only their own, but other people's lives, for the better - often by making simple changes to the way we do things. They inspire creativity, challenge perception and facilitate change. Their credentials speak for themselves and the results are nationally acclaimed. Universal Inclusion was founded by Jacqueline Winstanley Bsc Hons, global disruptor, Author and Public Speaker and it is rooted in her deeply-held and proven conviction to do what is possible to increase the equality of access to life’s opportunities for everyone.